Most definitions of "tonality" refer to specific properties of the 12-tone Western scale and are therefore of little use for a non-octave scale like Bohlen-Pierce (BP). The creator of the expression, however, the Belgian theorist (and composer) François Joseph Fétis (1784 - 1871), understood tonality more generally as a self-contained system of related harmonies, in which a basic harmony, the tonic, serves as the functional centerpiece. The Grolier "Encyclopedia of Knowledge" (Danbury, Connecticut, 1993) adds: "In its broadest sense, tonality in music means a sense of tonal gravity by which the listener consciously or subconsciously perceives that the main musical impulses arise from and flow toward one or a limited number of tone centers, the most important of these being the point of ultimate repose." Both these definitions permit to contemplate tonal properties of scales other than the traditional Western one. The design of the BP scale is based on the 7:5:3 triad, referred to as the "wide" triad. David Canright created the diagram below. It shows the rich pattern of wide triads (example: 1/1, 5/3, 7/3) and the inversion 1/3:1/5:1/7 (example 7/3, 7/5, 1/1) that pervade the chromatic version of the BP scale. This suggests that it should be possible to build tonal relations in the sense of the broader definitions above, at least within the framework of the chromatic scale. Another significant triad in BP is 9:7:5, called the "narrow" triad. Its pattern and that of its inversion 1/5:1/7:1/9 in a similar diagram are also convincing. However, the chromatic scale is rather a material scale. Are there "diatonic" modes that carry tonal potential? The following table shows the diatonic BP modes that so far have been the subject of some investigation. We choose 1/1 as our reference and the wide BP triad as the basic harmony. Making 1/1 the basis of the triad leads to the tones 1/1, 5/3, 7/3 (column 1 in the following table). Making 1/1 (or its equivalent 3/1) the central tone of the triad calls up 7/5, 9/5, and 3/1 (column 2). And 1/1 (3/1) as the top tone of the triad adds 9/7 and 15/7 (column 3). Column 4 shows the result: an 8-tone scale that with some justification can claim that its tonal center is 1/1. The outcome would be the same, by the way, if we would make use of the narrow triad (1/1, 7/5, 9/5) instead of the wide one. 25/21 and 25/9 in Lambda. At least these four BP diatonic scales can certainly be considered to represent "self-contained systems of related harmonies" and to convey "a sense of tonal gravity" if used to that intent. Thus they carry the promise that they will support the creation of tonal music, and perhaps not only in a more general sense. 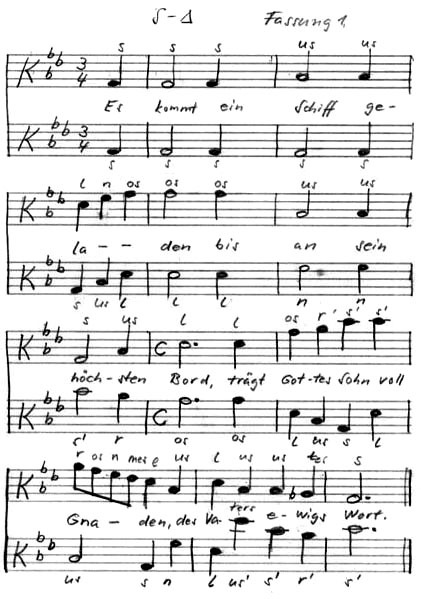 The key is s-delta, and the melody in both voices clearly develops from the tonic and returns to it (respectively its tritave) after emphasizing two important text elements ("hoechsten" and "Sohn") with just that chord. 22 years after it was written, this transscription has been used by Hudson Lacerda (Escola dé Musica da Universidade Federal at Belo Horizonte, Minas Gerais, Brazil) to test a MIDI program that he wrote. Theoretical contemplations of the traditional Western scale usually list three Major triads (I, IV, and V), three Minor triads (ii, iii, and vi) and a Diminished triad (vii*) that are incorporated in a Major diatonic scale, representing the basic material for forming chord progressions. We recognize that the first, third, fifth and seventh step can be the fundamental tone for both a Wide and a Narrow triad, thus presenting much opportunity for many patterns of chord progressions without violating tonality aspects. Elaine Walker has designed a number of BP chord progressions; acoustic examples can be found on her BP page.